Carrot and Apple Salad is made up of just a few ingredients, carrot and erm... apple being the main ones of course. I love a salad that has a touch of sweetness with plenty of crunch. I'm also a big lover of any kind of salad I can batch make for the week, and keep in the fridge, which just gets better and better with time. The basic ingredients in this salad are just grated carrots and apple, apple cider vinegar and balsamic vinegar with a touch of salt and pepper to season. You can go crazy with adding whatever else you fancy. Sunflower and sesame seeds go really well as do cherry tomatoes. I like soaking some sultanas in a little water and adding those too sometimes or a squeeze of lime juice. Grated beetroot is a wonderful addition, and adds plenty of colour. I tend to stay away from adding leaves to the bowl, favouring to pile mounds of the carrot and apple salad on top of mixed salad leaves when hunger strikes - that way the leaves won't go soggy after a day. For more tips and tricks, get The Un-Boring Salad Guide for free here! If you enjoy spicy food why not add a tsp of spicy paprika or some little chillies to the mix? Or keep the main part basic, and add whatever you're fancying on the day. This salad is a fab on the go basic lunch which you can pop in a tupper in the morning and add a variety of extras to before leaving the house. Mix all of the ingredients together thoroughly add pop in the fridge. It should keep for five days easily, I actually happily keep mine for seven! If it looks a little dry add a drizzle of olive oil. 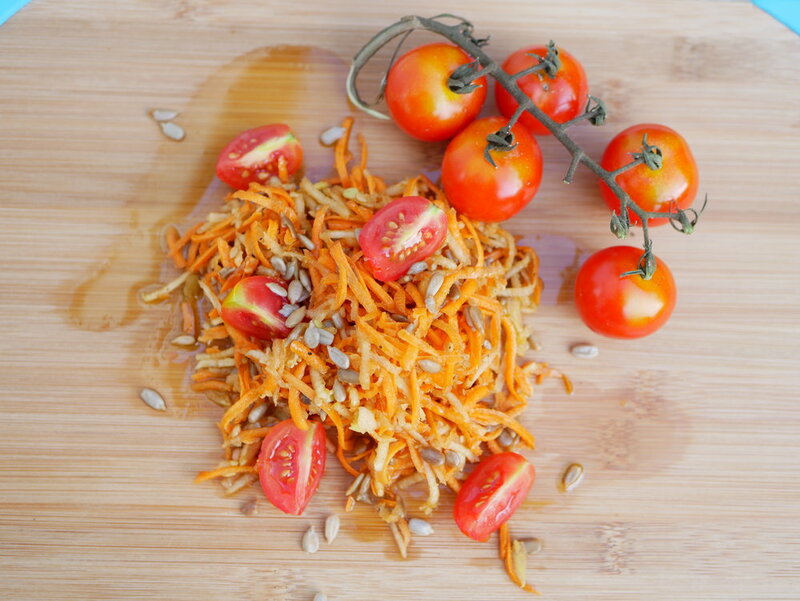 What will you be adding to your Carrot and Apple Salad?